The Victoria Combination was the most popular model produced by Société Parisienne E. Couturier et Cie of Paris. What began as a bicycle manufacturing company turned to motorized vehicles in 1899 and produced them through 1903. Engines from De Dion-Bouton and Aster were available. The car you see here sports a 2.75 horsepower De Dion. These were relatively popular in the early days of motoring with about 400 being made. At the time, it would have cost about $600 to purchase one (3,000 francs). And this car is 112 years old – there are only about ten people left on Earth who were alive when this was built! The fact that any car has survived that long should make it near-priceless. It’s an antique – but one you can use as this one appears to be in great shape. Plus, how many other front-wheel drive cars can you think of made prior to, say, a Cord L-29? Not many, I’m guessing. 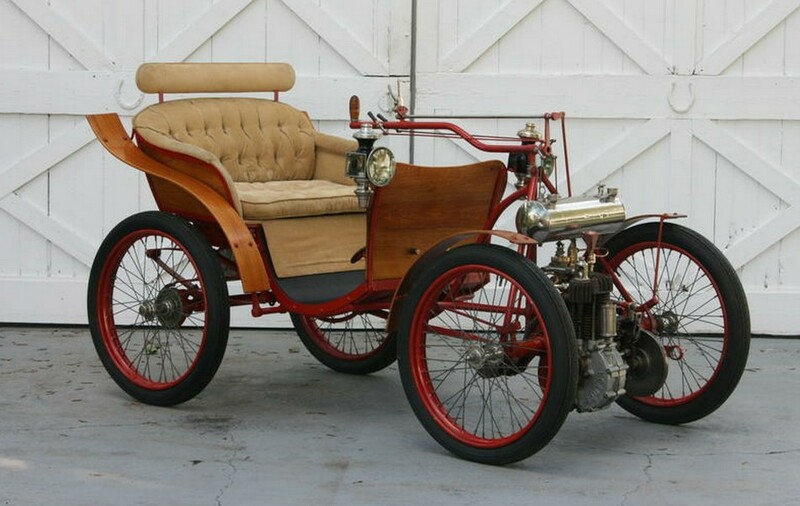 The pre-sale estimate for this rare and interesting early car is $50,000-$70,000. You don’t exactly see these everyday. To read the complete lot description, click here. And for more from Bonhams in Connecticut, click here. This entry was posted in Uncategorized and tagged 1900, auctions, Bonhams, cars, classic, classic cars, parisienne, victoria combination by classiccarweekly. Bookmark the permalink.